Thanksgiving again! 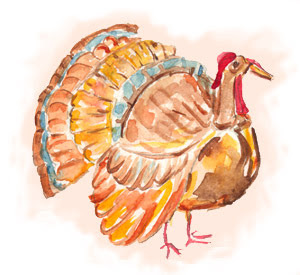 I am so lucky – I get to enjoy two thanksgivings every year! A Canadian thanksgiving in October and the original Plymouth pilgrim and Native American turkey day tomorrow. Ooh – are you ready? - Not to worry – me, and thousands of others are not ready either, just relying on our skills to pull at all together triumphantly on time - and with the sound of football games in the background, that time can be pretty flexible. I am planning on a classic roast turkey with all the trimmings- set out on an autumn table with candles lit. There will be two sons, two pies, two friends, and plenty of bonhomie to go around. Here’s a little recipe for the rest of the weekend - something to savor in the afterglow of an annual get together, it is a favorite of my good friend Wendy Lee, and a treat she always brings when she visits. Best served with coffee or hot tea, or wrap in a pretty teatowel and bring to a friend’s house- it stays moist for days! -Mix flour, baking soda and salt together. Put aside. -Cream butter and sugar together. -Beat in egg, vanilla and banana. -Stir in flour mixture until well-blended. -Spread in 9” square or 7” X 11” brownie pan. -Let the cake cool a bit before removing from the pan. I make a simple icing with butter, icing sugar, vanilla, milk and a pinch of salt (I am vague on the quantities as I do it by taste and consistency ) to slather on top- you can also use a tub of Betty Crocker vanilla icing as a time saver. Happy Thanksgiving, or just have a super weekend! Noticed the amount of vanilla is missing for cake recipe... could you post how much? Thanks!! My family loves eating banana.It's healthy fruit very much, to the point that we can’t live without it everyday. So when bananas are on sale or in season, I’d buy as many as we can consume. Then I’ll reserve some to wait them ripe enough and bake this beautiful and tasty banana cake. I always admired your collections. I used to buy your creations at Le Cache stores. I hope they will be available again..., not only online.